John reminded me that I haven’t been blogging much lately, and while I’m aware that this hardly qualifies as a true blog, it’ll have to suffice until something else piques my interest and little gray cells. First, I’m scheduled to teach at Theatre Lab starting this month. I taught a six-week course in “Auditioning for Musical Theatre” back in November/December, and I’m now booked to teach “Musical Theatre Workshop,” a six-week course starting January 26th. Originally we were going to start on January 12th, but what with the Inauguration and post-holiday craziness, a later start has been deemed a better start. The class will meet Monday evenings from 7 PM to 10 PM at the Theatre Lab classrooms at 733 8th Street NW (close to Chinatown) through March 9 (no class on March 2). If you’ve been on the fence about taking a class of this kind, this gives you another week or two sign up! I’m still finalizing the curriculum, but I promise you that if you take the class, you’ll get a lot of one-on-one attention – and you won’t be bored! 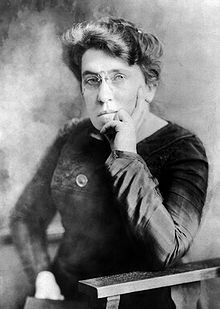 Second, I’m pleased to announce that I’ve been cast as radical anarchist Emma Goldman (pictured above) in the Kennedy Center’s upcoming production of Ragtime. I’ve always loved this show, but to be involved with a production of this caliber is really thrilling. It opens April 18 and runs through May 10. Tickets are already selling briskly, so I urge you to make your reservations ASAP. The full cast has yet to be announced, but what casting I know thus far promises an extraordinary production! Here’s to a bright new 2009! Hope yours has been happy so far! I am THRILLED to hear you will be playing Emma Goldman and I will be purchasing my tickets shortly. Gosh I love that show!Glad to hear so many things are going well for you lady!